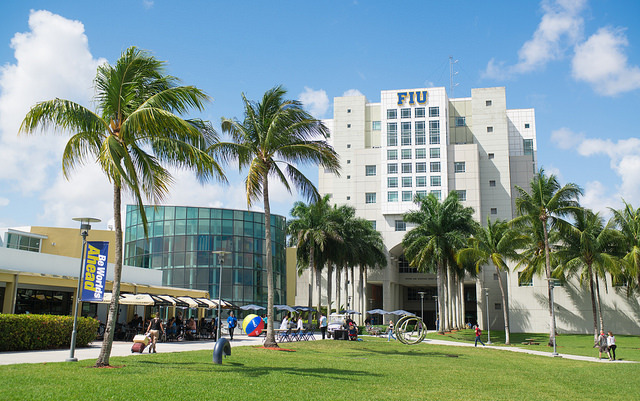 FIU is ranked number two among public universities in the state, according to the performance scores released by the Florida Board of Governors (BOG). The rankings are based on the BOG’s Performance Based Funding Model that includes metrics such as graduation rate, retention rate, cost to students and employment of recent graduates. Governor Rick Scott and the Legislature directed $560 million toward performance funding for the 2018-19 academic year, to be disbursed based on university excellence or improvement. FIU’s high standing this year means that the university will receive $12.5 million in additional funding, including one-time funding of $9.7 million for being ranked number two in performance points. The new money will increase investment in student success initiatives, serve as additional funding for top research programs strategically positioned to compete at the national level and increase efforts that support FIU’s climb in the national rankings. “Florida’s universities continue to deliver results for our students. I am proud that we have been able to hold the line on tuition in our state while still being able to make historic investments. We will never stop working to make Florida the best state in the nation for higher education,” Scott said. This year, FIU showed significant improvements in key areas: four-year graduation rate (5.5 percent improvement), cost to students (6.3 percent decrease), second year retention rate (5.7 percent increase) and issuing of bachelor’s degrees without excess hours (3.1 percent increase). The Student Success Initiative office analyzes enrollment data and targets at-risk students who are falling behind or are close to dropping out. Advisors reach out to students to offer support and solutions such as additional financial aid. FIU also launched “Finish in 4,” a campaign to educate students on the advantages of graduating in four years versus six years, which include thousands of dollars in tuition savings and potential unrealized earnings. To lower the average amount of money students are paying for their degree, FIU’s Office of Scholarships has increased scholarship dollars available to students. Another key factor in improving graduation rates has been the Mastery Math Lab, a program recognized by the White House in 2015 for increasing educational outcomes and opportunities. The news is commendable but FIU is still not in the Association of American Universities. Maybe set the FIU goals higher. Congratulations to all of those who contributed in these achievements. Next year, will be the FIRST PLACE. No doubts.